All is fair in love and war, and since battle terminology is often the metaphor used in sports, for better or worse, let’s discuss the day the San Antonio Spurs and David Robinson successfully staged a coup to overtake the Orlando Magic’s Shaquille O’Neal for the 1993-94 scoring title. The Admiral’s battle plan was simple: Stay in the game for as long as he could and take every opportunity to score. Going into the final game of the season, Robinson trailed O’Neal by an average of .06 points per game and needed a gargantuan scoring effort to swipe the crown from the center. Spurs coach John Lucas had the team feed Robinson the ball even when he was double- and triple-teamed for much of the 44 minutes he played to help Robinson score 71 points against the Los Angeles Clippers on April 24, 1994. Robinson’s previous career high was 52 points, and the Spurs’ previous team record was set by George Gervin in 1978 when he scored 63 points to put a bow on his scoring title. 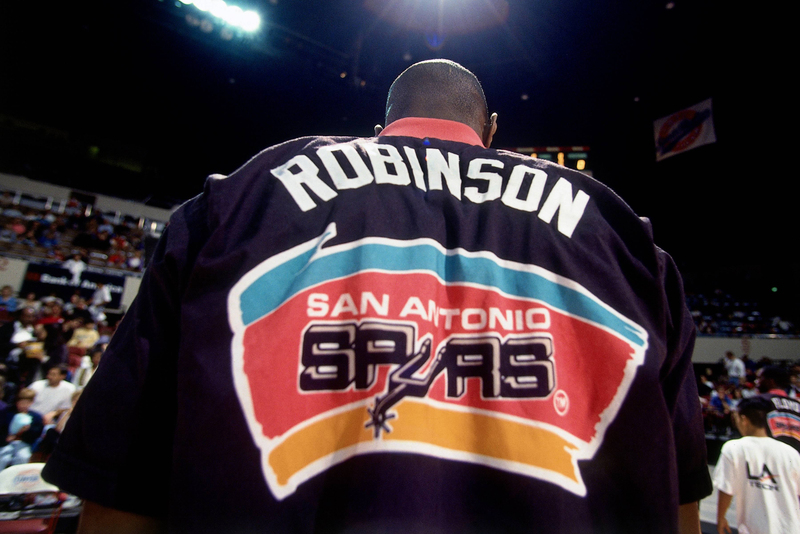 Robinson joined Gervin as the only players in Spurs history to claim an NBA scoring title. Robinson made it difficult for O’Neal, who needed 68 points against the New Jersey Nets to take back the title. The Magic center dropped 32 points and finished with a season average of 29.346 per game to Robinson’s 29.787. The Spurs’ method proved infuriating for purists: Robinson’s teammates began fouling Clippers players to get back on offense quicker, even though the Spurs were blowing out Los Angeles. David Robinson (No. 50) of the San Antonio Spurs stands on the court before the NBA game against the Los Angeles Clippers on April 24, 1994, at the Los Angeles Memorial Sports Arena in Los Angeles. Robinson scored the Spurs’ first 18 points of the game. With 23 seconds left in the first quarter, Negele Knight became the first Spur not named Robinson to contribute to the score with his jumper. Robinson was 26 of 41 from the field, including splitting a pair of 3-point attempts. In the second, third and fourth quarters, Robinson scored six, 19 and 28 points, respectively. With 1:33 left, he scored his 64th point with a free throw, and the Spurs’ lead increased to 101-80. Eighteen of Robinson’s 71 points came from the free throw line. His 18 made free throws tied a team record, and the 25 foul-shot attempts broke a team record. Lucas still wasn’t satisfied, so the team continued to foul, and Robinson scored his final seven points in the final 59 seconds. A 17-footer from the baseline with 37 seconds remaining rounded out Robinson’s scoring, and at that point Lucas took him out of the game. Robinson received a standing ovation from the fans at the Sports Arena. “Those were a legit 71 points. He played 44 minutes when he should have played 48,” Lucas told the Los Angeles Times. “Everybody wanted him to get it, and everybody was mad that he was passing some shots up. David deserves it. Sometimes I have to push David to become selfish,” Lucas said. Even the fans in Los Angeles wanted to see Robinson win the scoring title, and they turned on their own team when it held the ball to melt time away. It was the first 70-point game since David Thompson exploded for 73 as he hoped to overtake Gervin for the title on the final day of the 1977-78 season. Only Wilt Chamberlain and Elgin Baylor had scored 70 or more points before that. Dennis Rodman had a game-high 17 rebounds, but no other Spurs player scored in double figures. On the East Coast, O’Neal turned in a 32-point and 22-rebound night to help the Magic defeat the Nets. “It would have been nice, but 50 wins was more important to me than the scoring title,” O’Neal told reporters. “I heard they ran every play to [Robinson]. If that would have happened down here, I would have 70 points, too. I didn’t care,” the San Antonio Express-News quoted O’Neal as telling the Associated Press.